Abortion travel payments, Mount Everest races, a defence of screen violence and a Titanic escape room all feature in Northern Ireland's papers on Tuesday. Both the News Letter and Daily Mirror focus on UK government plans to pay the travel costs of some Northern Ireland women going to England for abortions. 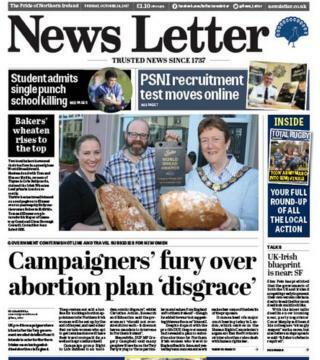 The News Letter says the plans have met with an angry reaction from some groups in Northern Ireland. Right to Life brands it an "anti-democratic disgrace". The paper also quotes DUP MP Gregory Campbell who says many people will see it as the Conservative government trying to "force particular values from England on Northern Ireland", though he says he was "not suggesting this was the case" himself. The Irish News has more on the murder of 51-year-old Anne O'Neill, who was killed at her parents' home in south Belfast at the weekend. A neighbour said police carried out searches of hedges and gardens on Monday. "I'm not sure what exactly they were looking for, but I assume a weapon of some description," the man tells the paper. In its front page story, the Belfast Telegraph says that over-generous fuel allowances given to staff by Northern Ireland councils are costing taxpayers millions of pounds. It says the government recommends a mileage rate for cars and vans owned by employees and used for business journeys at 45p per mile for the first 10,000 miles. However, it says at least nine NI councils are paying employees a rate of up to 65p per mile. Armagh City, Banbridge and Craigavon Borough Council led the way, spending £558,297 - more than twice the amount handed over by Belfast City Council at £223,470. Both the Telegraph and the Irish News feature the controversy over the graphic violence shown in the BBC drama Gunpowder, written by Belfast man Ronan Bennett. Saturday night's drama - based Guy Fawkes' plot to blow up King James I - included scenes of a woman being crushed to death and a priest being disembowelled, causing outrage from some viewers. However, the Irish News quotes Bennett's defence: "What you're trying to do is give the viewer the sense that they're not just watching something, they're not just spectators, but almost as if they're participating, almost as if they're there. "It's an immersive experience and this particular world is a barbaric one." The Belfast Telegraph also features the family of County Louth farmer Tom Oliver, who, the papers says, have broken their silence 26 years after he was abducted, tortured and murdered by the IRA. Mr Oliver's son Eugene, who was 13 at the time of his father's murder, said he was a loving man who "always gave us a hug every act". He says he had to "grow up overnight and take over the farm". If you're struggling during your park run at the weekend spare a thought for Belfast man Ken Tate, who is preparing to run the Everest Marathon for the second time at the age of 65. Image caption Fancy a brisk 26-mile run around Mount Everest? The News Letter says the route includes boulders, sandy scree, stone staircases, forest trails and exposed paths along the mountain sides. Mr Tate tells the paper that the last time he ran the gruelling race - in 2007 - he had a broken shoulder "and this slowed me down a little". Finally, plans for a Titanic "escape room" coming to Belfast in December have been described as "a very distasteful idea" in the Belfast Telegraph. An advertisement for The Titanic: The Final Hour says: "You and your shipmates try desperately to avoid the iceberg but are unable. "Now you only have 60 minutes to seal the water-tight doors, radio for help, put on your lifejackets; release the davits and get every woman and child into the lifeboats." Image caption Titanic escape room plans have been described as "distasteful"
President of the Belfast Titanic Society Susie Millar, whose great grandfather Thomas Millar was lost in the disaster, says it "doesn't sound like a good way to commemorate the loss of the ship". John Creamer of the British Titanic Society adds: "My personal thoughts are this is a very distasteful idea, and highly disrespectful to the memory of those who died. "The Titanic disaster was not a game." The company behind the plan - Timescape - says while it understands that there may be concern, "we have taken great care and effort in carefully recreating an authentic, historical and educational environment that is respectful".